My copy of this classic was bought in the gift shop at the Alhambra in Granada and has a beautiful aubergine-coloured cover. It is a special edition to mark the 175th anniversary of the first publication of the American writer’s stories. Irving was a writer and diplomat, lodging in rooms at the beautiful Moorish palace. 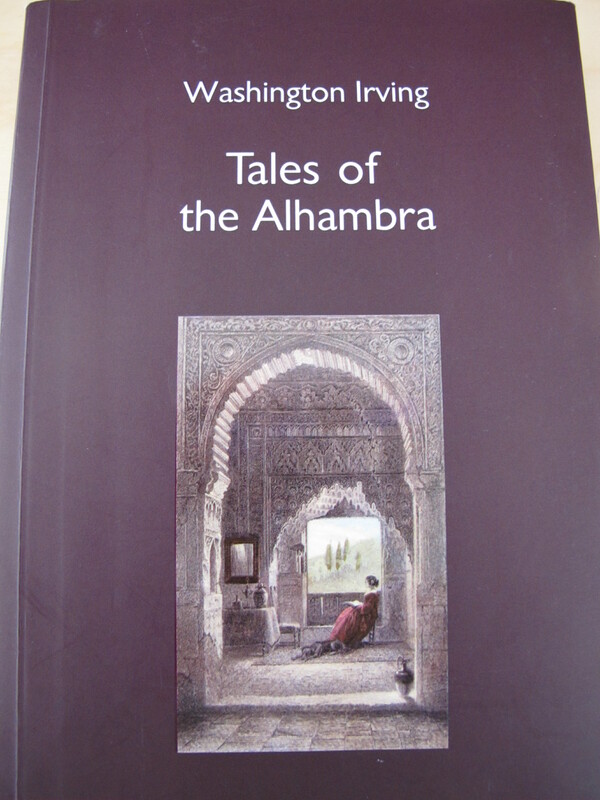 This book is a collection of stories and folklore that he collected during his time at the Alhambra, delightful tales of lost treasure, lovelorn princesses and brave soldiers. Irving wrote at the time of his fears that his writing was insubstantial: “How unworthy is my scribbling of the place.” My favourite tale is that of the mason, who is taken blindfold by a priest in the middle of the night to build a vault underneath a fountain at a secret destination. He labours for a number of nights to build the vault, finally helping the priest to load heavy urns into the secret space. He is paid each night with a piece of gold. The mason keeps the secret for many years, until one day he is asked by a curmudgeonly old man to do some repair work on an old property previously inhabited by a miserly priest who died suddenly. There are rumours of ghosts and the clinking of coins at night, and no new tenant can be found. The mason recognises the fountain, offers to live in the house rent-free and repair it for the owner. The mason becomes one of the richest men in Granada, and the clinking of coins is only heard in daylight from that time on. This entry was posted in Books about Spain and tagged Alhambra Palace, Andalucia, book review, Granada, Sandra Danby, Spain, spanish history on May 7, 2013 by sandradan1.